Does a luxury cruise ship feel different from a mainstream cruise ship? How so? Just like luxury resorts, high-end cruise ships are spacious and that's denoted by the line's space-to-passenger ratio, which is always quite high. Your ship will never feel crowded -- even though it will be smaller than mass-market cruise ships that hold thousands of passengers. You'll be happy to know that on a luxury cruise ship, you'll never have to fight for a lounge chair at the pool or a seat in the lounge. All these elements combine to create a comfortable, upscale environment in which to enjoy your vacation. Does the size of the ship impact the onboard ambiance? The smaller the cruise ship, the easier it is for the cruise line to provide a more personalized experience that is customized just for you. Whether it's Crystal Cruises' 62-passenger Esprit yacht or Regent's 750-passenger Seven Seas Explorer, you'll find far fewer than the 4,000+ passengers that Royal Caribbean's Anthem of the Seas greets each week. In addition, luxury ships have a high space-to-passenger ratio, so fewer people are crowded into the available space. Ships that offer a high space-to-passenger ratio generally also have a high crew to guest ratio as well. With fewer passengers to tend to, each officer and crew member can truly respond to -- and even anticipate -- your needs. That could mean receiving a unique gift in your suite (SeaDream provides personalized pajamas) or your butler delivering your favorite canapes every day at sunset. The chef might whip up a baked Alaska just for you because you raved to your waiter about the time you tried it when you were last on the ship. 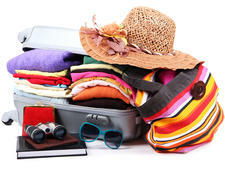 All of these factors lead to less crowding, fewer lines and a less stressful vacation. Embarkation -- which can be intimidating on a mega-ship -- is a breeze on a small ship, and can often be a festive start to your cruise with bar staff handing out Champagne and passengers chatting with each other. And with so few people onboard, you're likely to see your shipmates again and again, lending itself to a social atmosphere. How do crewmembers interact with passengers on a luxury sailing? Certain cruise lines have a more formal feel than others, but all crew members aboard luxury ships are trained to treat passengers with the utmost respect. They strive to be friendly and warm but a bit reverential too. They are tasked to memorize your names as soon as you board and will address you by name. Crew aboard lines like Crystal or Regent generally address travelers by last name -- for example, Mr. and Mrs. Smith -- while other lines like SeaDream Yacht Club and Windstar Cruises may lessen the formality by using Mr. and Ms. with your first names (i.e., Mr. John or Miss Theresa). Officers and crew on a luxury ship generally want to know how you're enjoying your vacation and will stop to talk with you in the hallways or lounges. If there is a problem or they hear about something you were disappointed in, they proactively follow up on it and provide a solution. If they find out you're celebrating a birthday or anniversary during the voyage, you can bet they'll share that information with your butler, room steward, bar staff and waiters so you are assured to receive many well wishes -- and even a few special treats (maybe a card and balloons delivered to your suite or a special dessert served at dinner) -- on the big day. The wait staff and bartenders listen carefully to your requests and learn your favorite drink, snack and dining preferences very quickly. They'll do their best to anticipate what you might want next -- a cool skewer of fruit or bowl of ice cream at the pool deck on a hot afternoon, for example. When you dine at the buffet, don't be surprised if a waiter appears to carry your plate of food back to your table; that's the norm on luxury lines. Whatever crewmembers can do to help you, they'll try. How does the all-inclusive nature of luxury cruises add to the onboard atmosphere? 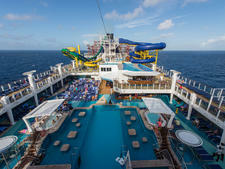 Many cruise lines use the term "all-inclusive" but it means different things on different lines. For luxury cruise lines, "all-inclusive" really does include just about everything, from all beverages (juice, milk, soda, coffee/tea, wine, spirits and beer) to gratuities, a multitude of restaurants with no surcharge, and complimentary transportation into town at most ports of call. Regent Seven Seas Cruises even includes unlimited shore excursions; Regent and Silversea also offer free Wi-Fi to all guests. 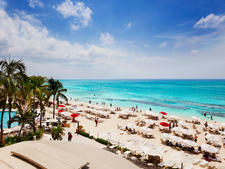 The benefit of this all-inclusive approach is the traveler feels more carefree onboard. You won't feel nickeled and dimed because you won't be signing chits for drinks all the time at the bar, or paying extra to dine at one of the ship's restaurants. The all-inclusive nature of the voyage makes you feel a bit more pampered. It also means more people are likely to frequent the lounges at night and join newly made friends for an evening, since no one has to worry about who's paying. People are also more relaxed because they don't have to think carefully about budgeting and can just enjoy themselves. Being that first impressions are so important, what should I expect on embarkation day? The goal of any cruise line is to wow passengers with a smooth embarkation process. Luxury cruise lines do that with a few small touches that go a long way. For example, in hot, sunny homeports the line will erect a canopy outside the cruise terminal; this means passengers will remain a bit more comfortable if there is a queue, or unexpected rain. Hot and cold drinks and even sometimes a cookie or two are offered at the terminal if you arrive before passengers have been cleared to board the ship. Luggage handlers will take your bags while you go through the security screening process. On luxury lines, the entire process might only take a few minutes and you'll soon be headed to the gangway. You'll be met at the gangway by a variety of the ship's officers and crew who offer a genuinely warm greeting -- often accompanied by a glass of fine Champagne. You'll take care of check-in details at one of the ship's lounges while you sip a cocktail and have a snack, and then you'll be accompanied directly to your suite where you'll be introduced to your butler or room steward(ess). That person will explain anything you need to know about the stateroom (i.e., how the temperature controls and in-room entertainment system work, or your options when it comes to pillows and bath amenities). Once ensconced in your room you'll find a note from the hotel manager or captain welcoming you aboard, along with a platter of fruit or a box of chocolates next to a chilled bottle of Champagne or sparking wine. How does the dress code underscore the ship's ambiance? The dress code is probably the single most important way a ship can communicate the vibe it's striving for to its passengers. In years past, just about every luxury line had mandatory formal nights that required a tuxedo and gown (or at least a suit and cocktail dress). But these days the luxury lines have relaxed dress code requirements. Not everyone is happy about that, because some people believe that dressing up in the evening elevates the entire cruise experience. Crystal, Regent and Silversea loyalists are more apt to dress formally in the evenings than travelers aboard Oceania and SeaDream Yacht Club. In fact, there are no formal nights on Oceania ships, while they are optional on Regent vessels. Be prepared for one or more optional formal nights on Silversea. 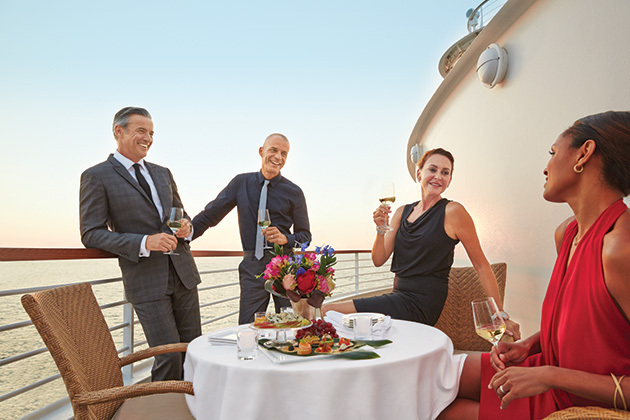 (If you don't want to take part in formal festivities on Silversea ships, dine at La Terrazza, Seishin, Stars and The Grill instead and you can wear informal clothing.) 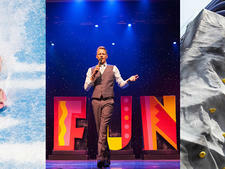 Crystal Cruises also offers a Black Tie Optional evening; men can wear dark suits instead of a tux. (You may dress casually if dining at Tastes.) Seabourn programs one formal night for cruises up to 13 days but the dress code is only enforced in The Restaurant. (You may wear "elegant casual" attire in the other restaurants on that evening.) SeaDream doesn't do formal night at all; it's resort casual in the evenings. But, the fact is, even with relaxed dress codes over the past few years, luxury cruise travelers are still a fashionable bunch who tend to wear designer brands -- day and night -- and dress a bit more formally, especially in the evenings. Jeans, T-shirts and sneakers are not welcome in the dining rooms of luxury cruise ships in the evening. Nearly everyone "dresses" for dinner, even if the outfit is more country club casual than ultra formal. On formal night, there will be plenty of men in suits -- and some in tuxes -- and women in gowns or cocktail dresses. Do other passengers tend to be friendly and welcoming or cliquey and reserved? Many travelers worry that a luxury cruise could be a stodgy experience. Will other guests be welcoming and want to get to know you, or are people more reserved on these types of voyages? That depends. If you're looking for the most relaxed atmosphere, your best bets would be SeaDream Yacht Club and Oceania Cruises. Both of those lines focus on creating a convivial atmosphere where people want to mix and mingle and get to know one another. Those lines are also less formal than, say, Crystal Cruises or Regent, and that can help loosen up some passengers that would otherwise worry about how they look on formal night or what to talk about at dinner with their seatmates. That said, luxury cruise travelers are pretty social people and enjoy meeting people during activities like trivia or shore excursions, and dining with a new group at dinner. One thing to be aware of: Almost all of the top-of-the-line cruise companies offer world cruises or longer grand voyages. If you book just one sector on these longer trips, it can be tough for you to break into an already established clique of people who have been traveling together for a few weeks (or months!). Keep that in mind when you select your itinerary aboard a luxury ship. What luxury touches create a more pampered feeling in my cabin or suite? The high-end lines want to ensure your comfort in your suite. To that end, they offer everything from high-end linens from the likes of Pratesi and Frette as well as pillow menus (Silversea, for example, offers a choice of firm goose down, synthetic hypoallergenic or therapeutic foam pillows) and designer toiletries placed in spacious marble bathrooms. Silversea offers a choice of hypoallergenic, Ferragamo or Bvlgari bath products. Oceania also offers Bvlgari while Seabourn offers items by Molten Brown or L'Occitane. Regent and Windstar also use L'Occitane products while Crystal offers Etro. You'll also find a complimentary bar setup and stocked minibar in your cabin on most luxury ships. Many ships also offer butlers in certain suite categories, with Silversea employing butlers in all accommodations. Depending on the cruise line and suite category, butlers perform a range of services, from unpacking your suitcase to serving breakfast on your balcony and canapes in the afternoon. Where can I expect to find touches from today's top designers and brands? Your luxury cruise ship will be outfitted from stem to stern with the highest quality products from some of the world's most sought-after designers and brands. You'll find a Frette robe hanging in your Crystal Cruises stateroom closet. A luscious box of Leonidas Belgian Chocolates will be waiting for you in your cabin aboard Paul Gauguin. 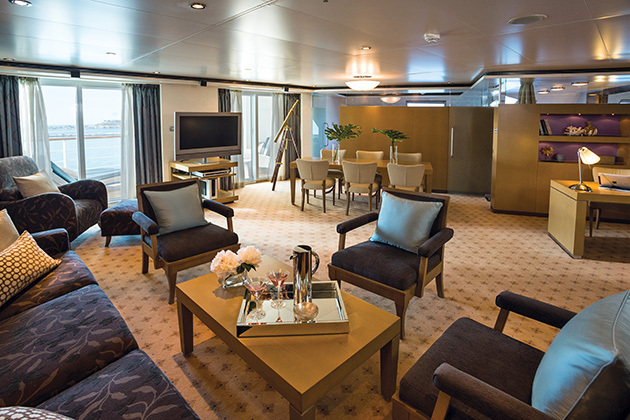 Regent installed illy espresso makers in each of its cabins, and Silversea's beds are made with Pratesi linens. 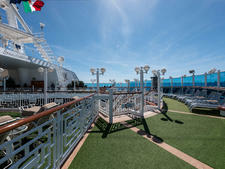 Many cruise lines, including Regent, offer complimentary use of Apple iPads or have ensuite iPod docking stations. 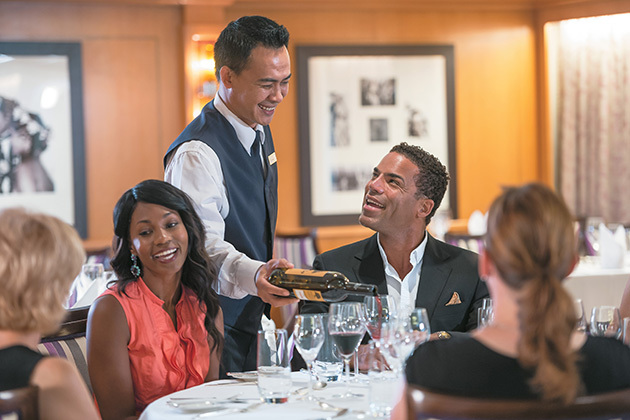 In SeaDream's dining room you'll toast the meal with a glass of wine in a Riedel goblet. Likewise, the spas will be operated by well-known concerns on land. Cruise ship boutiques also often carry a variety of designer brand apparel and jewelry so it's always fun to do a bit of shopping for a special souvenir. What type of ambiance do the ship's restaurants exude? If you feel uncomfortable dining at five-star restaurants on land, a luxury cruise might not be right for you. That's because you'll be fussed at by a host of people in the dining room, ranging from the maitre d' (the host and manager of the dining room) and sommelier (someone to help you make wine selections), as well as a waiter and often an assistant or two. Why does your waiter need assistants? Meals are often served under silver domes, and it takes a band of waiters standing tableside in order to unveil everyone's meal simultaneously. Some aspects of dining in any high-end restaurant can be intimidating and that's no different on a cruise ship. Expect to be greeted by a table set with multiple forks, spoons and knives; fancy "charger" plates by designers such as Villeroy & Boch; and a variety of stemware from makers like Riedel. Every single dining venue on a luxury ship -- from the ship's main dining room to the specialty restaurants -- offer extraordinary multicourse menus designed by world-class chefs in a generally formal setting. In fact, some lines even have partnerships with celebrity chefs who either contributed to the menu design across all dining establishments or have a specific restaurant onboard. Jacques Pepin collaborates with Oceania Cruises, Thomas Keller creates menus for Seabourn, and you'll find Nobu Matsuhisa with Crystal Cruises. Expect menu items like prime aged beef, duck and quail, made-to-order sushi and homemade pasta. Finicky eaters might see these menus as a bit "fussy," but there is always a group of more traditional entrees available, ranging from grilled chicken, salmon and steak to plain pasta dishes. Dessert will usually include an excellent cheese course, homemade ice cream, cakes and pies or creme brulee. Specialty coffees and after-dinner cordials are also on the menu. With diners ordering multiple courses from salad and soup and appetizers to an entree, dessert and cheese course, meals can be long -- and sometimes drawn out -- affairs. 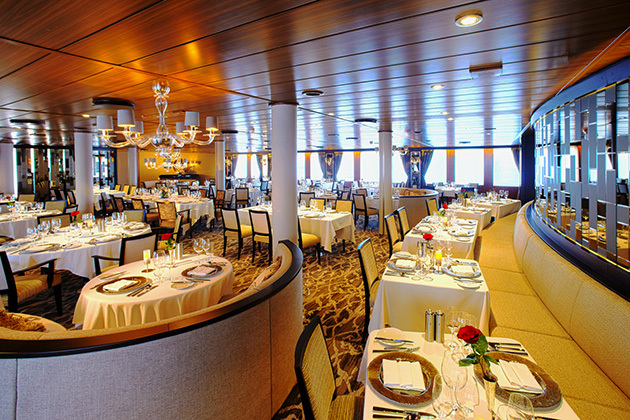 It's almost impossible to have a "quick meal" in a luxury cruise ship's main dining room. Will there be works of art by well-known artists on the ship? You can almost guarantee that your ship will be decorated with works of art from the great masters as well as more contemporary artists. Cruise lines like Silversea hire curators who put together exhibitions that rival what you'd enjoy in a museum on land. Silversea has a partnership with Andrew Weiss Gallery and might have pieces -- some originals but mostly reproduction prints -- onboard from Pablo Picasso, Renoir, Andy Warhol and Salvador Dali. 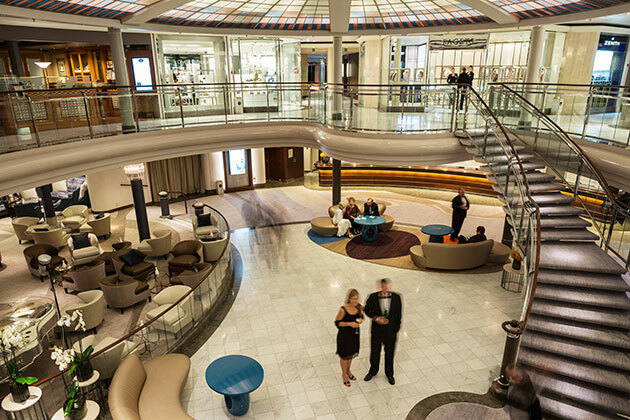 Regent Seven Seas Cruises has a relationship with Park West Gallery. Seabourn, Oceania Cruises and Crystal Cruises also curate museum-quality artwork for their ships. How do I learn more about cruise ship ambiance?